In the longer term, because their teeth are growing all the time; and if their diets are lacking in fibre (from grasses, hay, etc. ); dental problems can occur, leading to overgrown teeth, inability to eat food (or soft poos – more on this later! ), spurs on these teeth (that can physically cut the inside of their mouths), abscesses and infections, problems with tear drainage, eye infections, diarrhoea, and eventually death. So all in all, not particularly nice! Rabbits and other small furry creatures are herbivores, and belong to a sub-group which we will call fibrevores. Meaning that their diet should consist mostly of high-fibre foods – as mentioned above, things like hay and grass. In addition to this, they should always have water available; and can have a small amount of nugget type food. It is best to avoid muesli-type food (if possible), as they pick out the tastiest bits, and leave the less tasty (and usually more beneficial!) bits. 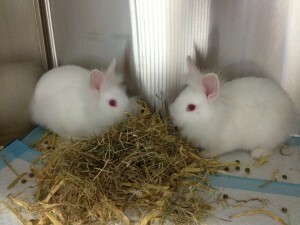 However, its not just food that Rabbits (and Degus, Chinchillas, and similar mammals) eat. They eat their own poo, too. With the digestion of food comes bacteria that live in the guts, partially digested bits of fibrous food, and other useful nutrients and vitamins; and in most animals this is where the journey ends, leaving these behind in a lump of faeces. The special poo, or caecotrophs, produced by bunnies, which contain all of these useful bits and pieces, are then re-digested leaving the familiar firm droppings that all small furry owners see in the cage or litter tray. So, from the point of view of house-sitting and rabbit-care, with a bunny (or similar creature) just make sure they’re getting the correct amounts and types of food – ask their owners to let you know how much and how often they’re fed – including their treats of course (little bits of fruit and veg are fine, but not too much! ); and make sure they’ve always got a supply of fresh water (usually from a drinking bottle). Learn About Your House-Sitting Charges – in rabbit care, watch out! They Can Hide Illness! 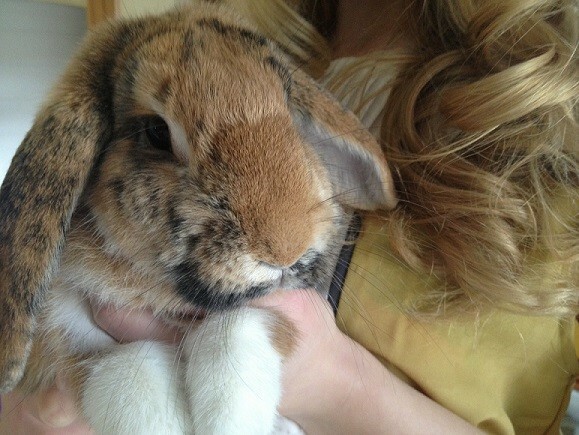 When pet sitting and house-sitting for a bunny, make sure you get to know the bunny first – again it may be worth popping round to meet the rabbit, get to know him or her, find out whether or not he or she likes to be handled; whether or not they are litter trained; that sort of thing. Rabbit care is more of a challenge than you might imagine, being prey species, tend to hide things like illness very well; which is why its important to get to know them (and their owners!) before house-sitting – a bunny could be quiet because they’re just a laid back bunny; or they could be quiet because their mouth is painful due to ulcers, they have snuffles (or another disease, like Myxomatosis), they have diarrhoea and are dehydrated, or one of any number of things. But you wouldn’t know unless you got acquainted with the bunny first! It is worth preparing for your pet-sitting and rabbit care. So, just make sure you as the owner of the bunny/ies are happy with the house-sitter; and you as the house-sitter are happy to look after their beloved pets.